Sharing Is Caring. Or Is It? Note: as is true with all SharePoint 2013 early blog posts. SharePoint 2013 is in preview, features may change, and thus facts about those features may become invalid. When I was consulting on Enterprise Content Management technologies, I became very fond of the “pre-mortem” practice, plan ahead for what is probably going to go wrong. Then we’d think of ways we could have prevented the project’s failure—a sort of after-the-fact analysis done beforehand. Well, guess what! SharePoint 2013 is out. There are two categories, as I see it, of new features in SharePoint 2013. First is the end-user experience. Great new Metro UI, some new sharing and social stuff, and just overall a lot crisper. Then there are some major platform things, such as moving workflow engine outside of SharePoint. But the middle layer, for the most part, what I refer to as information architecture, has remained more or less the same. So what new element in SharePoint 2013 is going to cause problems? Well, I think I found it. Have you ever heard of a little disorder companies face called “SharePoint Sprawl”? In SharePoint 2007, it was like wildfire. Partially because the platform had advanced so much on the user side, and companies were so enthusiastic. In SharePoint 2010, there was what seemed to me a lot more control. SharePoint Sprawl is the crazy thing that happens when adoption is too good. You get sites, maybe even site collections, everywhere. You get unbounded security. And ultimately a modern version of a common problem—share drives. This is not the goal companies should seek when deploying SharePoint. It should be a balance between end-user freedom and control. What I’m using as the modern definition of governance. The thing about sprawl is it’s viral, so those features that make it even easier for users to open up doors are the ones guilty of advancing sprawl. Do I hate these features? No, I don’t. Very often I like them. But I want to be on my toes for when a company gets all excited about using these features without planning their governance. The neat new “Share” button is such a feature. It’s always been possible to share content, sites, and site collections. But as you may know, all it takes is a small change to make something become more adopted. Let me paint a scenario for you. An active user of SharePoint named Lydia contributes and consumes content on a regular basis. She recently uploaded a document that she, being in the HR department, needs to share with someone in the sales department for some collaboration. Now at Lydia’s company, security boundaries are at the department level, so Frank in sales does not have access to Lydia’s site. Lydia, though she has used SharePoint for some time, has never shared a document before, and is not 100 percent sure how. She stares at the screen for a few moments, and gets a little frustrated—“How do I freakin’ share this document!” She sees the “Share” button—“Oh, there it is”—but what she has just shared is the entire site. Normally this would not get approved, but due to the IT department’s support load, it’s overlooked. Now Frank has contributor access to the HR site. What happens if Frank then shares? Look at the screenshot below. I’m going to try to share Central Admin. That can’t be a bad idea. OK, I know. Obviously there are so many things that could be done to prevent this, but mark my words,it will happen. Sharing is caring. 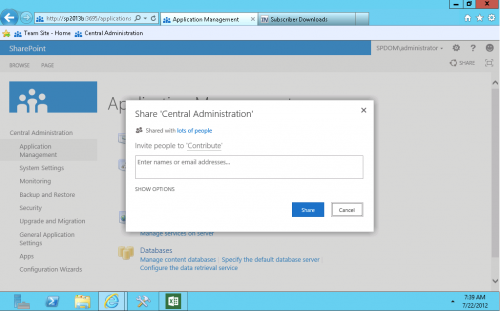 There is SHAREpoint, Microsoft really cares; there is CloudSHARE, and we care too. But Sharing things you should not is a recipe for disaster. So there is my prediction. The simple addition of the new “Share” button and feature I think, when not properly considered, will be a new wave of SharePoint sprawl in SharePoint 2013.